I mentioned last week that we are going to do some exploration of two fairly new trends in New Testament scholarship. Both directed at trying to understand what Paul was trying to say. Both of these trends can be described as somewhat controversial because they may challenge some aspects of long standing Christian thinking. But to the proponents of these trends they seem to answer a number of questions about Paul that were troublesome to some. The two trends, as I described briefly last week involve (1) reading some of Paul’s writings as rhetorical arguments, and the second trend is (2) a new way of interpreting Paul that has been labeled “New Perspectives on Paul”. Today we are going to focus on the first trend, rhetorical Paul, and set the stage for possibly understanding Paul in a slightly different way. So today, we will plunge into the world of ancient Greek rhetoric. As we get into this review we will be jumping back and forth into some of Paul’s letters to use them as examples. Most historians credit the ancient city-state of Athens as the birthplace of classical rhetoric. Because Athenian democracy marshaled every free male into politics, every Athenian man had to be ready to stand in the Assembly and speak to persuade his countrymen to vote for or against a particular piece of legislation. A man’s success and influence in ancient Athens depended on his rhetorical ability. Consequently, small schools dedicated to teaching rhetoric began to form. The first of these schools began in the 5th century B.C. among an itinerant group of teachers called the Sophists. The Sophists would travel from polis to polis teaching young men in public spaces how to speak and debate. A typical Sophist curriculum consisted of analyzing poetry, defining parts of speech, and instruction on argumentation styles. They taught their students how to make a weak argument stronger. Both Plato and Aristotle condemned Sophists for relying solely on emotion to persuade an audience and for their disregard for truth. Despite criticism from their contemporaries, the Sophists had a huge influence on developing the study and teaching of rhetoric. Aristotle and "The Art of Rhetoric"
Logos - an argument based primarily on logic. Logos is the logic behind an argument. Logos tries to persuade an audience using logical arguments and supportive evidence. Ethos denotes the disposition, character, or fundamental values particular to a specific person, people, culture, or movement. In rhetoric the speaker often uses Ethos from the start of any presentation by convincing the audience that he or she is a “good” person that can be trusted. Pathos represents an appeal to the emotions of the audience, and elicits feelings that already reside in them. Pathos is a communication technique used most often in rhetoric. Promotes a desire to go back in time, perhaps when things were better. Uses exaggeration to make a point. What Rhetorical Approaches Did Paul use? An Epistolary Diatribe is basically a presentation to correct the incorrect ideas of someone else. It can be in a short form, or in a much larger format called a Scholastic Diatribe. Paul uses both. A word first about the word diatribe. In English today the word diatribe often refers to a venomous, harsh verbal tongue-lashing. The original Greek had an entirely different meaning. The diatribe is a rhetorical format used often in an academic setting in philosophical schools to convince a class to change their way of thinking on a subject. The purpose of a diatribe then was not to inform but to transform the class. It was thus used primarily for ethical or religious instruction. How Do We Recognize a Diatribe? First of all it has certain characteristic elements that appear repeatedly. 1. The frequent use of rhetorical questions. 2. The repeated use of “imaginary interlocutors”. These are imaginary protagonists that Paul is arguing with while in the argumentative phases of the diatribe. This is a fancy way of saying that Paul is not always the speaker. This is considered to be one of the persuasive powers of the diatribe – the speaker (Paul) is not attacking the class (in this case the Roman Christians) but is arguing with someone else and the Roman Christians are simply listening to the argument – and therefore does not feel threatened and is more likely to listen to the logos/ethos/pathos of the argument. 3. Frequent use of the apostrophe! A direct verbal assault on the identified interlocutor. 4. A “speech in character”. An extended speech to elaborate on a particular point in which the speaker (Paul) is playing an (again) imaginary character. 5. Refutations of arguments. An imaginary interlocutor raises an objection to Paul’s argument and Paul immediately refutes it. 6. Appeals to authority. Once an argument is made the speaker then backs it up by quoting an authority that agrees with him. With Paul the authority is always Jewish scripture. Therein is the problem – how to recognize who is saying what. In modern English writing it can be straightforward. The writer simply states who is speaking by saying something like “..and then Paul said..”. This is then followed by quote marks surrounding everything Paul says. But Paul's letters were written in Koine Greek, the standard Greek that Alexander the Great established across his empire. 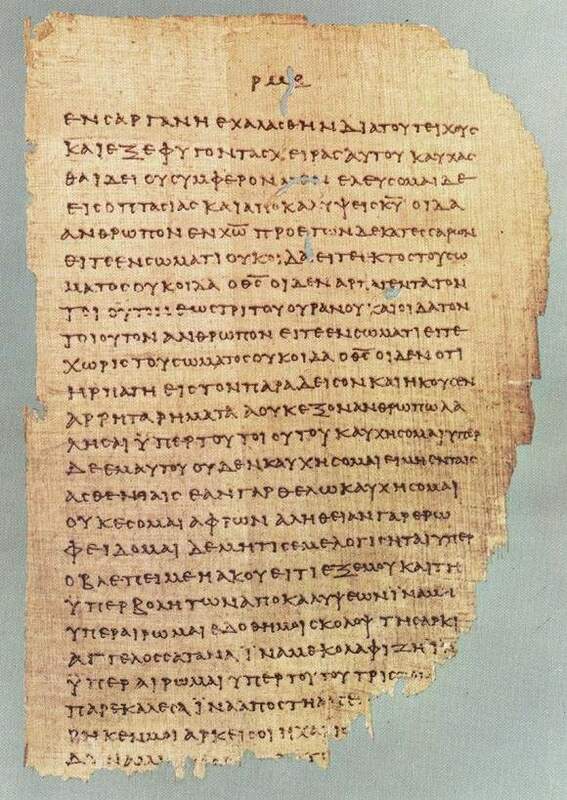 Everything in the New Testament was written in koine Greek. There are no punctuation marks, quote marks, or even spaces between words. How could anyone possibly know who was speaking and where their speech stopped? Note - This Was Not a Problem for the Audience! With no punctuation marks the writer (Paul) would use well known rhetorical “markers” to indicate who was talking. Quotes from the interlocutor were usually preceded by the word “say”; ex: “But You have heard it said”, or “But someone will say”. The words following that are known to be the words of the interlocutor. The refutation from Paul is then indicated by an adversative conjunction (like “but “ or “of course not”, or "however", or "therefore", followed by some gentle (or not so gentle) name calling. Let's now take a look at one scholars analysis of the structure of Romans as a Scholastic Diatribe. A diatribe always begins with a simple statement of the proposition – what the argument is going to be about. In this case the proposition is Romans 1: 16-17. So let’s look at the structure. The main proposition is followed by four sub-propositions. And each of those is divided up into an expository part and an argumentative part. So what does that mean? In each case the expository is Paul talking directly to the Roman Christians and presenting things about the sub-proposition that he is pretty sure they all agree on. Once he has softened them up a little on that he then moves into the argumentative. 18 For the wrath of God is revealed from heaven against all ungodliness and wickedness of men who by their wickedness suppress the truth. 19 For what can be known about God is plain to them, because God has shown it to them. 20 Ever since the creation of the world his invisible nature, namely, his eternal power and deity, has been clearly perceived in the things that have been made. So they are without excuse; 21 for although they knew God they did not honor him as God or give thanks to him, but they became futile in their thinking and their senseless minds were darkened. 22 Claiming to be wise, they became fools, 23 and exchanged the glory of the immortal God for images resembling mortal man or birds or animals or reptiles. 24 Therefore God gave them up in the lusts of their hearts to impurity, to the dishonoring of their bodies among themselves, 25 because they exchanged the truth about God for a lie and worshiped and served the creature rather than the Creator, who is blessed for ever! Amen. 26 For this reason God gave them up to dishonorable passions. Their women exchanged natural relations for unnatural, 27 and the men likewise gave up natural relations with women and were consumed with passion for one another, men committing shameless acts with men and receiving in their own persons the due penalty for their error. 28 And since they did not see fit to acknowledge God, God gave them up to a base mind and to improper conduct. 29 They were filled with all manner of wickedness, evil, covetousness, malice. Full of envy, murder, strife, deceit, malignity, they are gossips, 30 slanderers, haters of God, insolent, haughty, boastful, inventors of evil, disobedient to parents, 31 foolish, faithless, heartless, ruthless. 32 Though they know God’s decree that those who do such things deserve to die, they not only do them but approve those who practice them. 1: Therefore you have no excuse, O man, whoever you are, when you judge another; for in passing judgment upon him you condemn yourself, because you, the judge, are doing the very same things. 2 We know that the judgment of God rightly falls upon those who do such things. 3 Do you suppose, O man, that when you judge those who do such things and yet do them yourself, you will escape the judgment of God? The stance of this entire set of argumentation (all the way to verse 32) is to reinforce what Paul has said before – all have sinned and fallen short of the glory of God. He is careful to point out that even though both Gentiles and Jews have sinned – they have done so for different reasons. For the Gentiles, their sin was that they ignored the creator God and thus fell into depravity. For the Jews they did not ignore God, but they did not obey God’s laws. But all have sinned. Now, let us return to the Diatribe Structure for a review of Proposition 3. And this time we will look at the argumentative part only, because it is a very interesting example of a speech-in-character. In the argumentative section of this sub-proposition we see what has been described by some scholars as a classic speech-in-character. It extends from verse 7 all the way to verse 25. Below are verses 7-13. 7 What then shall we say? That the law is sin? By no means! Yet, if it had not been for the law, I should not have known sin. I should not have known what it is to covet if the law had not said, “You shall not covet.” 8 But sin, finding opportunity in the commandment, wrought in me all kinds of covetousness. Apart from the law sin lies dead. 9 I was once alive apart from the law, but when the commandment came, sin revived and I died; 10 the very commandment which promised life proved to be death to me. 11 For sin, finding opportunity in the commandment, deceived me and by it killed me. 12 So the law is holy, and the commandment is holy and just and good. 13 Did that which is good, then, bring death to me? By no means! It was sin, working death in me through what is good, in order that sin might be shown to be sin, and through the commandment might become sinful beyond measure. 14 We know that the law is spiritual; but I am carnal, sold under sin. 15 I do not understand my own actions. For I do not do what I want, but I do the very thing I hate. 16 Now if I do what I do not want, I agree that the law is good. 17 So then it is no longer I that do it, but sin which dwells within me. 18 For I know that nothing good dwells within me, that is, in my flesh. I can will what is right, but I cannot do it. 19 For I do not do the good I want, but the evil I do not want is what I do. 20 Now if I do what I do not want, it is no longer I that do it, but sin which dwells within me. 21 So I find it to be a law that when I want to do right, evil lies close at hand. 22 For I delight in the law of God, in my inmost self, 23 but I see in my members another law at war with the law of my mind and making me captive to the law of sin which dwells in my members. 24 Wretched man that I am! Who will deliver me from this body of death? 25 Thanks be to God through Jesus Christ our Lord! So then, I of myself serve the law of God with my mind, but with my flesh I serve the law of sin. Note that the rhetorical marker "What then shall we say?" is in verse 7. This is the signal that everything that follows is another character talking. This is not Paul. This is an imaginary character that is a protagonist of Paul. What follows is a very long speech-in-character that extends through the remainder of chapter 7. Paul does not return until chapter 8. What makes this interesting is that this rather bizarre "rant" is the most cited speech about Paul by critics that indicates Paul may be mentally unstable because he is in such anguish about his status with God. Yet, if you follow the rhetorical insight - this is not even Paul talking. 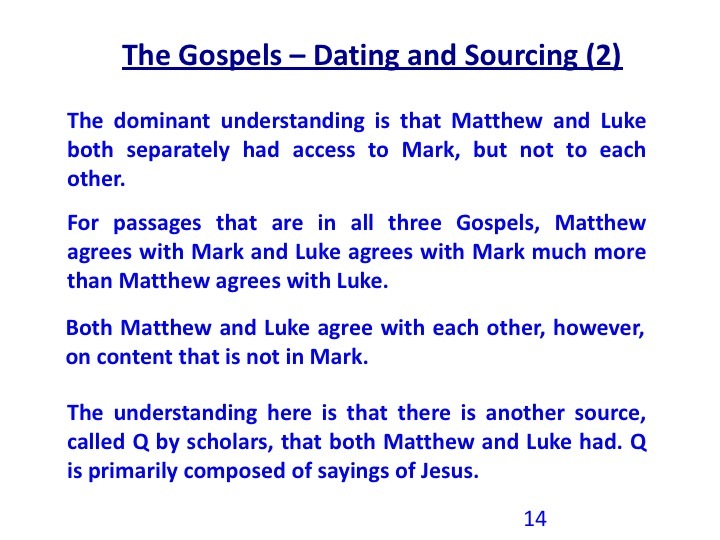 This example may show one of the chief learnings of rhetorical analysis of Pauline epistles, because it indicates that reading Paul as a rhetorician might give insight into when we are actually hearing Paul, and when we might be hearing one of his protagonists. The scholarly art of reading New Testament letters using rhetorical analysis is now becoming much better known but still in it’s very early stages in terms of influencing New Testament scholarship. Whether it really changes much in terms of influencing theology is still unclear. But it still may be important as it develops in helping us understand why writers like Paul wrote the way they did in their Epistles. For myself, I do not intend to become a rhetorical expert. I will leave that to the expert New Testament scholars, and wait for them to publish more in the future and help us understand Paul better. In the next three weeks we will use Paul's letters to examine what the problems were in Paul's churches. And we will do that by going through 1st and 2nd Corinthians.